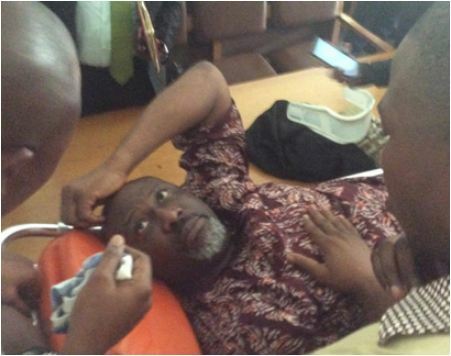 “The arraignment of Senator Dino Melaye on a stretcher in Abuja and Lokoja is unacceptable in a civilised society. It is particularly degrading and humiliating as it violates the fundamental right to the dignity of his person guaranteed by Section 34 of the Constitution and Section 7 of the Administration of Criminal Justice Act, 2015. “Even though the Senator has my sympathy it is indistinguishable that he has only been given a little dose of the humiliating treatment that is daily meted out to the flotsam and jetsam of our unjust society by the Nigeria Police Force and other law enforcement agencies in Nigeria. “Therefore, the senator’s case should not be treated in isolation by the Senate and the bourgeois media. While the solidarity of the federal legislators with Senator Melaye is understandable, the tragic turn of events calls for sober reflection. “Apart from joining the call for the immediate release of Sheik Ibraheem Elzakzaky, and Col.